Is your pharma exhibition stand a conversation starter? All too often, organisations think that merely showing up with a good looking stand and waiting for people to come to them is all it takes. And that’s why some exhibitors fail. To stand out from the crowd, your pharma exhibition stand has to reach out and appeal to attendees in new and absorbing ways. To attract footfall to your booth we use colour, signage and lights to deliver maximum visual impact, to attract the eye, and to draw attendees to you. But there’s no point in getting people to your exhibition stand if there's no incentive for them to talk to you once there. So, in addition to making sure your display stands out, we also ensure that it is a catalyst for conversations. The good news is that there is an abundance of technology available to help us help you to achieve your objectives. Here are some examples of tried and tested ‘booth boosters’. Data and advanced event marketing automation. Of course, for heavily regulated industries such as pharma, there are strict rules that have to be followed. But having an ethical exhibition stand doesn’t mean you have to give up the creativity. We just have to be a bit smarter when it comes to design and promotion. And here again technology can help. Rather than worrying about how to distribute information within the regulations, it pays to use your exhibition stand as a catalyst for knowledge sharing. For example, you could integrate tablets, dynamic displays, screens and even virtual or augmented reality into your exhibition stand to disseminate information. RFID (radio-frequency identification) technology can also be used to guide visitors around a pharma exhibition stand, creating an interactive and informative journey that enhances their overall experience. When it comes to creating a winning show presence, integrating technology into your next exhibition stand design could provide that much-needed return on investment. 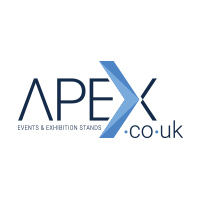 However, while tech can help exhibitors to provide compelling, multi-sensory experiences for attendees, at Apex we never make our designs reliant on technology alone. Our core stand design still works, even if your budget doesn’t stretch to fancy gadgets and software. We also have some fantastic non-tech options to help you increase footfall. These include break out areas that use clever seating to encourage people to strike up conversations and tasty food and drink. And it goes without saying that we always work within the parameters of your industry and location. Crucially, before we do anything, we make sure you understand why you’re attending a particular exhibition in the first place. So, any additions we suggest will always support your tradeshow objectives. For more information on buying an exhibition stand and making it work for you, our handy checklist will help you to you reach your goals and achieve a truly positive experience.